Blake Hemming 00:13:50 Mi Casa Mexican Rest. 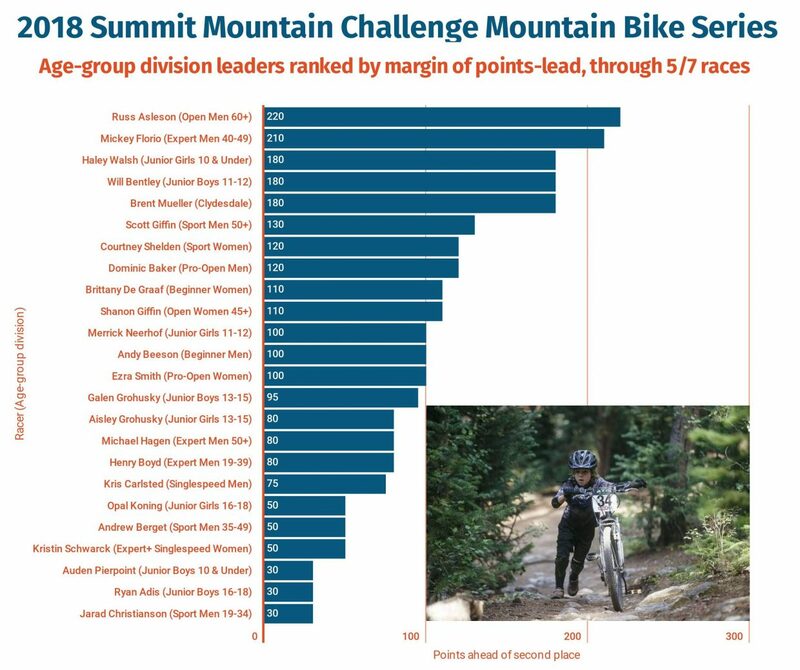 Heading into the final two Summit Mountain Challenge Mountain Bike Series races of the summer season, it’ll be a tight competition between three 10-and-under local boys who have found success all summer long. Blake Hemming has crawled closer to the top two riders in the season-long standings for the Junior Boys 10 & Under age division with his win at Wednesday evening’s fifth race of the summer series, the Soda Creek Scramble. With his time of 13 minutes and 50 seconds on the 3.6-mile Soda Creek Kids Course in Keystone, Hemming improved his season total to 390 points. That’s just 20 points behind the series’ second-place rider Landon Laverdiere (410) and 50 points back of first-place rider Auden Pierpoint (440). At Wednesday’s Soda Creek Scramble, the Junior Boys 10 & Under division saw 16 competitors, the most of any of the 22 divisions. Pierpoint finished in second place (14:35) while Laverdiere finished in third place (14:49). For each race in the summer series, those who finish in first place for their division are awarded 100 points, 90 points to second place and so on through 50 points for sixth place. Beneath sixth place, competitors are also awarded points at intermittent diminishing values. The Junior Girls 13-15 division saw the second highest turnout of any division on Wednesday, with 15 total racers on the 9-mile small course. Summit Nordic Ski Club athlete Nina Schamberger won her second consecutive series race at the Soda Creek Scramble with a time of 49:57. She has only entered two races this season. SNSC and Summit Endurance Academy athlete Aisley Grohusky finished second to Schamberger on Wednesday and leads the division this season with 410 total points. That’s 80 points ahead of Victoria Uglyar, who finished in sixth place at Wednesday’s race and won last month’s Breck Enduro. Of the adult races on Wednesday, the Sport Men 35-49 division saw the highest turnout, with 14 competitors taking to the 15.5-mile big course. Ivan Uglyar won the race with a time of 01:21:45, earning 100 points to improve his series standing to a tie for second place (290 points) with Brooks Leedahl. They both trail divisional series leader Andrew Berget, who finished in third (01:25:22) behind second-place finisher Leedahl (01:23:15) and Uglyar on Wednesday. In the adult women’s races, the Sport Women division had the largest turnout with 10 riders on the small course. With a time of 47:21, Ruthie Boyd won the division’s race on Wednesday, earning 100 series points to improve her season standing to second place (300 points). Though Boyd has won all three of the Summit Mountain Challenge races she’s entered, she remains 120 points behind Courtney Shelden (420 points), who on Wednesday finished her second consecutive race in second place, with a time of 48:54. The Summit Mountain Challenge returns for its penultimate race of the series on Aug. 22 with the Peaks Trail Time Trail before concluding on Sept. 8 and 9 with the Fall Classic.